Aula de Adriana: 3º British: How to comment a map in Geography? 3º British: How to comment a map in Geography? It's time to practice your first individual map comment... You ask for something "easy" such as sports, and here you have it! Obviously, it is a thematical map (analytical? synthetical? static? dynamic?) but it is incomplete because only shows 6 sports (It is not showing winter activities (Finland) or rugby (New Zealand), for example). Now it's your turn! 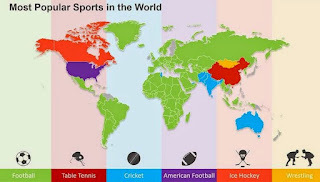 Remember to include the CAUSES (several options for explaining why those are the 6 most popular... and causes here are not only linked to sport) and the CONSEQUENCES of that situation (both positive and negative). When finish, send your comment as an attached file to blogeducativo08@gmail.com. I'll answer you back with the corrections a.s.a.p.